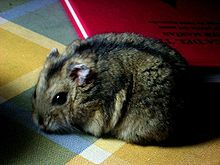 (countable) A hamster is a furry rodent a little larger than a mouse and with a very short tail. They are popular as pets. This page was last edited on 23 April 2017, at 20:27.